I still remember the Halloween my mother duded me up as the then-TV hero Green Hornet. There was the dark green hand-me-down, knee-length coat, which was too uncool for me to wear as a raincoat. The green mask covering my eyes, and the toy gun in my pocket, completed the get-up. I think it was the only time I dressed up as a crime-fighting hero. 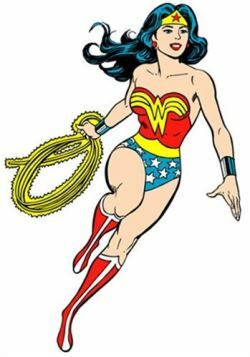 But this year, the 6-year-old has brought Wonder Woman into our household. Let’s say that’s where it all began. The Young One, a committed witch lover, had already been giving her costume a test run. Witches are fine in this household (just not too evil). Then she received an invitation to a friend’s birthday party — come dressed as your favorite super hero! On the sly, I went Internet shopping. Ta-da! A mighty fine Wonder Woman outfit, for $25 (new). I didn’t say anything until it arrived, then put it in her room where she’d find it. She loved it. It’s a great costume: One piece superhero skirt/blouse/cape; tiara; belt; shoe-cover boots; and whatever those silver arm thingies are called. Of course, it still took a bit of duct tape (hidden, of course) to make it work — keep the boots from flopping off the shoes underneath, and woven rainbow bands to keep the boot-top fabric in place. Of course, in the name of full disclosure, Daughter already had a Girls Rule the World, Wonder Woman t-shirt. She’s wearing her new costume to school for the Halloween event and then she’ll wear while trick-or-treating with Mom in our neighborhood. Ole Dad gets to stay behind, sitting out on the porch swing and giving out candy to the few children who make the wrong turn and end up coming down our block. The last couple years have been ideal, weather-wise, and make for good chat-with-the-neighbors evenings. Daughter and Mom go a little further, deeper into the neighborhood each year. They still return in time for daughter to take over candy distribution. I guess we always pretty much made our costumes when we were kids. My favorite was the year a neighborhood buddy and I teamed up to make a bona-fide flying saucer. We started with a shallow plastic wading pool. We cut round windows in the sides and connected two boards across the width, so we could flip the pool bottom-side up. We held on to the boards to steady it. We hooked up a couple of battery-flashlight bulb combinations and did our best to paint the whole contraption a shade of silver. It looked great. But we hadn’t anticipated needing sight lines, or how we’d handle the challenge of getting through spots that were more narrow than the saucer’s width. Also overlooked: Where the candy should be deposited. We managed that. Still, this was a masterful Halloween presentation. We rushed through that afternoon, trying to finish before dark (and our neighborhood’s annual Halloween parade). I think that’s what Halloween really is about: Long after we forget the candy and get the cavities filled, it’s the best memories that stay with us. At least that’s what I hope that’s the case for Wonder Woman.